The first trailer for Dame Judi Dench’s film, Victoria and Abdul, has been released. Even as early as now, it’s clear that this film might earn Dench another Academy Award nomination. 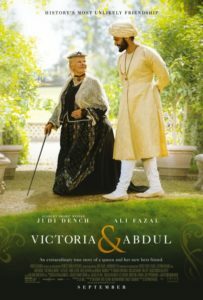 Victoria and Abdul is directed by Stephen Frears (The Queen, High Fidelity) and it explores the unlikely friendship Queen Victoria strikes with an Indian clerk (played by Ali Fazal). This is the second time Dench will be playing the great monarch. She first played the role twenty years ago, in Mrs. Brown, directed by John Madden. It also tackled another controversial friendship of the queen, this time with Scottish servant John Brown (Billy Connolly.) Though a relatively small film, it was Mrs. Brown that got the attention of major producers in Hollywood, and thus launched Dench’s Hollywood film career. The trailer reveals sumptuous scenes showing the glory of the queen’s reign and smaller, more intimate conversations with her new friend. A particularly interesting exchange involves the queen expressing her curiosity about mangoes. “No one really knows what it’s like to be queen,” Victoria says in a rare moment of self-doubt, “Everyone I’ve loved has died and I just go on and on…What is the point?